Maximize performance in your race built 2011-2016 Ford 6.7L Powerstroke with the MBRP C6262304 4" Pro Series Downpipe-Back Competition Exhaust. Constructed from T304 stainless steel, the Pro Series delivers optimal durability. 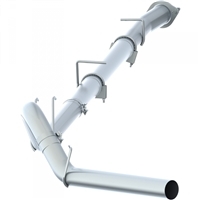 The Mach FORCE XP exhaust is engineered to perform in the most extreme environments. This system is constructed from mandrel bent 5"" 409 stainless steel tubing for maximum flow, increased horsepower, increased torque and lower EGT’s. Systems are available in 5"" down-pipe back, No Muffler, Mach FORCE XP exhaust systems are the perfect combination of performance, fit and value. The Best Systems Start with the Best Materials Maximize performance in your race built 2011-2016 Ford 6.7L Powerstroke with the MBRP C6260SLM 4" SLM Series Downpipe-Back Competition Exhaust System. The Best Systems Start with the Best Materials Maximize performance in your race built 2008-2010 Ford 6.4L Powerstroke with the P1 Race Parts C6254SLM 4" SLM Series Downpipe-Back Competition Exhaust System. The Best Systems Start with the Best Materials Maximize performance in your race built 2011-2016 Ford 6.7L Powerstroke with the MBRP C6260PLM 4" PLM Series Downpipe-Back Competition Exhaust System.